Petcube unveiled two smart pet cameras, Petcube Bites 2 and Petcube Play 2, completely redesigned to be all-in-one cameras for modern pet parents. 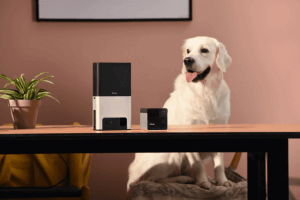 Re-engineered for better remote experience, Petcube Bites 2 and Petcube Play 2 feature extended wide angle lens with up to 180° full-room view, best-in-class two-way audio, now with 4-microphone array, as well as significantly improved connectivity, including 5GHz WiFi support. With Alexa built-in, both devices will allow Petcube users to access over 50,000 Alexa skills, including playing music, controlling smart home devices, setting alarms, listening to the news, and checking the weather hands free. Petcube Bites 2 treat camera has been redesigned to be even more compact to accommodate small and large spaces, providing more options for placement. An updated treat flinging mechanism allows users to better control treat portions and supports a greater variety of treat sizes. Petcube Play 2 is the third generation camera modeled off the original Petcube Camera, with an iconic cube design and built-in interactive laser toy, re-engineered to be super precise and smooth. Both Petcube Play 2 and Petcube Bites 2 work best with Petcube Care subscription services. Care watches after your home and pets when everyone is away. Using powerful AI technology, Care understands what pets are doing, registering important events like cat, dog, or human movements, barks or meows, and helps to discover any abnormal behaviors. Both next-gen cameras feature 1080p HD video, 4x digital zoom, and night vision. Powered with AI technology, Petcube gives pet parents real-time smart alerts about potentially dangerous events, with audio recognition of barking and meowing, and the ability to tell the difference between cats, dogs, and people. Petcube Bites 2 and Petcube Play 2 will come this spring in two colors: Matte Silver and Carbon Black. Petcube Bites 2 is priced at $249 and Petcube Play 2 is $199. Visit Petcube at CES 2019 in Venetian Suites, Suite 30-135 and Suite 30-137.